The minimal kit and the little extras are the sort of thing that get carried around on a day-to-day basis, just in case an opportunity arises. 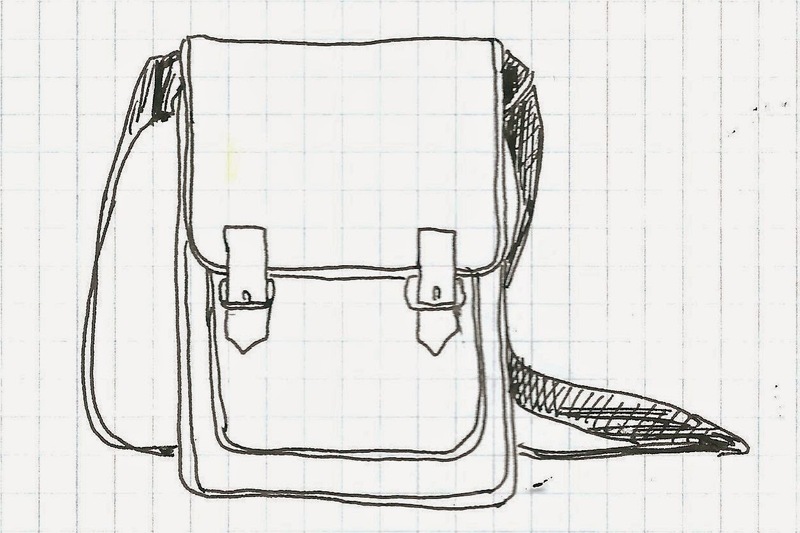 This post looks at the equipment that I might take on a sketching expedition, with an emphasis on how it's carried. In general, I wouldn't use an easel for the sort of sketching I tend to do outdoors. Setting up the easel (for all it's called a sketching easel) just seems too long-winded and too much like doing a proper painting. So I don't go much bigger than A3 - which is close to the limit of what I can hold in my arms. This is a dedicated piece of luggage, sold for the purpose of carrying lots of pencils - and a few other bits and pieces - by Derwent. 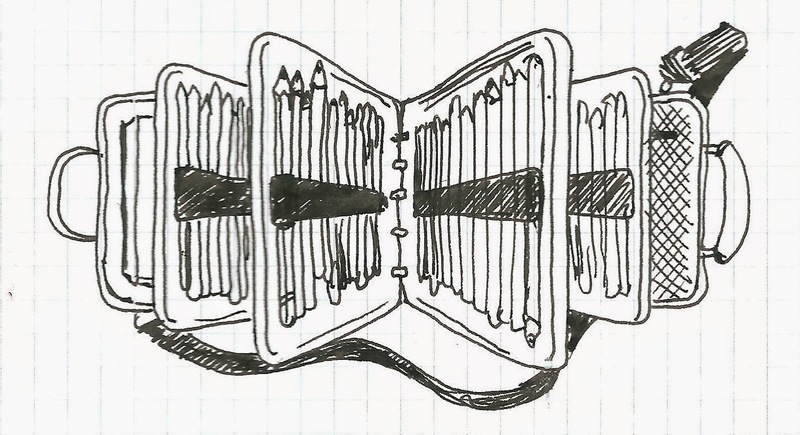 Because the pencils are held in elastic loops on organiser panels within the bag, it is easier to locate the pencil you want than it would be if they were all loose in a standard pencil case. It's not big enough for an A4 book, but A5 fits with space to spare. A 12 x 9" pad fits beautifully; I have a watercolour pad in there at the moment. I often pop my little watercolour set into the body of the bag; it hasn't fallen out and got lost yet. As to the pencils - well, I have quite a variety in there. There's the full range of Derwent Drawing colours; a selection of Coloursoft; some tinted charcoal and some pastel pencils; a collection of watercolour pencils and a few random extras. This is a bag that I bought in the sale from Sports Direct. It is just big enough for an A4 sketchbook and has a number of useful pockets. It's nice to have a shoulder bag that you can dip into to pluck out sketching materials as required. And what sketching materials might I take out in this bag? Whatever fits - the "little extras" often go in. Big sketches need big sketch pads need big bags. 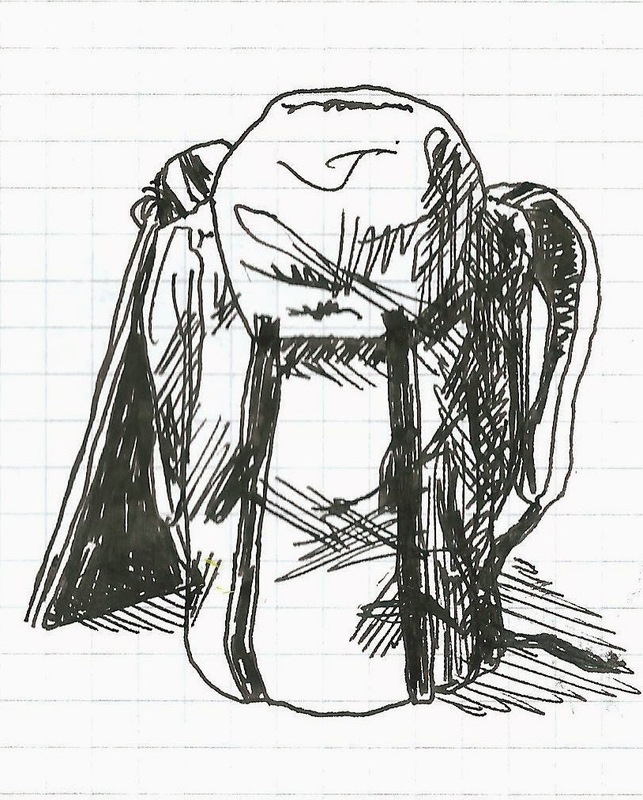 I tend to use a rucksack; the bulk is then safely out of the way when I'm not drawing. The "little extras" often get employed here, too. Note: The drawings in this post were mainly drawn from memory and/or imagination (apart from the boots). They were all drawn in liquid ink rollerball on squared paper.